The ONLINE CBT (Computer Based Test) will be generally in conformity with the educational standards and/or minimum technical qualifications prescribed for the respective posts. 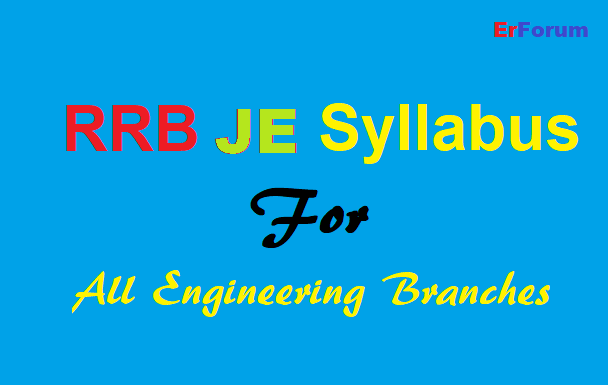 For RRB JE there is no any official detailed syllabus shared by Railway Boards but only an indicative syllabus is available. The Question paper will have 150 questions, out of which 90 questions will be of Technical Ability & General Science and 60 questions from General Awareness, Arithmetic, General Intelligence and Reasoning. The technical portion of 90 questions shall cover basic concepts of Science and Engineering from all the branches/disciplines of educational qualifications, prescribed for respective categories. There shall be negative marking in ONLINE (Computer Based) examination and marks shall be deducted for each wrong answer @ 1/3 of the marks allotted for each question. *You have to prepare basics of all Engineering branches regardless of your stream.